A. R. Rahman is an Indian composer, singer-songwriter, music producer, musician, multi-instrumentalist and philanthropist. Described as the world's most prominent and prolific film composer by Time, his works are notable for integrating Eastern classical music with electronic music sounds, world music genres and traditional orchestral arrangements. He has won two Academy Awards, two Grammy Awards, a BAFTA Award, a Golden Globe, four National Film Awards, fifteen Filmfare Awards and thirteen Filmfare Awards South in addition to numerous other awards and nominations. His extensive body of work for film and the stage earned him the nickname "the Mozart of Madras" and several Tamil commentators and fans have coined him the nickname Isai Puyal (English: Music Storm). In 2009, Time placed Rahman in its list of World's Most Influential People. The UK based World Music magazine Songlines named him one of 'Tomorrow's World Music Icons' in August 2011. Having set up his own in-house studio called Panchathan Record Inn at Chennai, arguably one of Asia's most sophisticated and high-tech studios, Rahman's film scoring career began in the early 1990s with the Tamil film Roja. 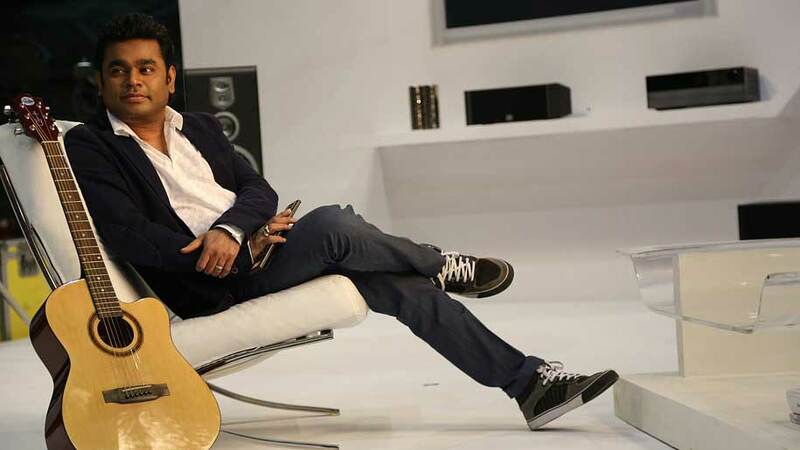 ﻿Working in India's various film industries, international cinema and theatre, Rahman is one of the world's all-time top selling recording artists. In a notable career spanning two decades, Rahman has garnered particular acclaim for redefining contemporary Indian film music and thus contributing to the success of several films. Rahman is currently one of the highest paid composers of the motion picture industry. He is a notable humanitarian and philanthropist, donating and raising money for beneficial causes and supporting charities. Skilled in Carnatic music, Western classical, Hindustani music and the Qawwali style of Nusrat Fateh Ali Khan, Rahman has been noted to write film songs that amalgamate elements of these music systems and other genres, layering instruments from differing music idioms in an improvisatory manner. Symphonic orchestral themes have accompanied his scores, occasionally employing leitmotif. In the 1980s, Rahman recorded and played arrangements on monophonic sound, synonymous with the era of his musical predecessors K. V. Mahadevan and Vishwanathan–Ramamoorthy. In later years his methodology changed as he experimented with the fusion of traditional instruments with new electronic sounds and technology. Rahman's musical interests and outlook stem from his love of experimentation. Rahman's compositions, in the vein of past and contemporary Chennai film composers, bring out auteuristic uses of counterpoint, orchestration and the human voice, melding Indian pop music with unique timbre, forms and instrumentation. By virtue of these qualities, broad ranging lyrics and his syncretic style, the appeal of his music cuts across the spectrum of classes and cultures within Indian society. His first soundtrack for Roja was listed in Time's "10 Best Soundtracks" of all time in 2005. Film critic Richard Corliss felt the "astonishing debut work parades Rahman's gift for alchemizing outside influences until they are totally Tamil, totally Rahman." Rahman's initial global reach is attributed to the South Asian diaspora. The music producer Ron Fair considers Rahman to be "one of the world's great living composers in any medium".
" I had come to the music of A. R. Rahman through the emotional and haunting score of Bombay and the wit and celebration of Lagaan. But the more of AR's music I encountered the more I was to be amazed at the sheer diversity of styles: from swinging brass bands to triumphant anthems; from joyous pop to West-End musicals. Whatever the style, A. R. Rahman's music always possesses a profound sense of humanity and spirit, qualities that inspire me the most." Rahman has introduced the 7.1 technology in south Indian movies to provide better output. "Vellithen Kinnam Pol", for the Malayalam film Penpada. This track credited to his father, was sung by Jayachandran and penned by Bharanikkavu Sivakumar. His film career began in 1992, when he started Panchathan Record Inn, a music recording and mixing studio attached to the backyard of his house. Over time it would become the most advanced recording studio in India, and arguably one of Asia's most sophisticated and high-tech studios. He initially composed scores for documentaries, jingles for advertisements and Indian Television channels and other projects. In 1987 Rahman, then still known as Dileep got his first opportunity to compose jingles for new range of watches being launched by Allwyn. In 1992, he was approached by film director Mani Ratnam to compose the score and soundtrack for Ratnam's Tamil film Roja. During the filming, it's Cinematographer Santosh Sivan signed A. R. Rahman up for the Malayalam movie Yodha, directed by his brother Sangeeth Sivan released later in September 1992. The debut led Rahman to receive the Rajat Kamal (Silver Lotus) award for Best Music Director at the National Film Awards, an unprecedented win for a first-time film composer. Rahman has since been awarded the Silver Lotus three more times for Minsara Kanavu (Tamil) in 1997, Lagaan (Hindi) in 2002, Kannathil Muthamittal (Tamil) in 2003, the most ever by any composer. Roja's score met with high sales and acclaim in both its original and dubbed versions, led by the theme song "Chinna Chinna Aasai" bringing about a marked change in film music at the time. Rahman has worked with Indian poets and lyricists such as Javed Akhtar, Gulzar, Vairamuthu and Vaali. He has consistently produced commercially successful soundtracks when collaborating with particular film directors such as Mani Ratnam, who he has worked with since Roja, and the director S. Shankar in the films Gentleman, Kadhalan, Indian, Jeans, Mudhalvan, Nayak, Boys, Sivaji and lately for Enthiran. In 2005, Rahman extended his Panchathan Record Inn studio by establishing AM Studios in Kodambakkam, Chennai, thereby creating the most cutting-edge studio in Asia. In 2006, Rahman launched his own music label, KM Music. Its first release was his score to the film Sillunu Oru Kaadhal. 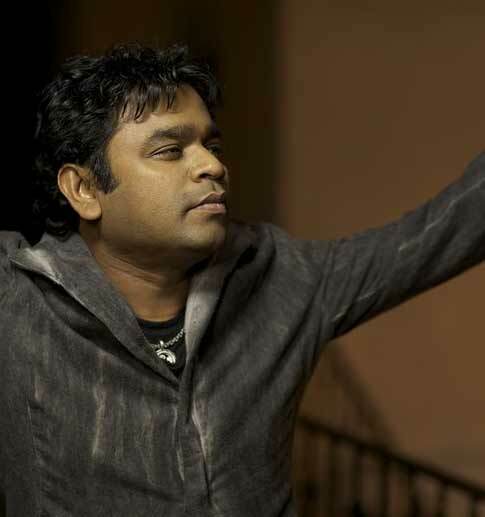 Rahman scored the Mandarin language picture Warriors of Heaven and Earth in 2003 after researching and utilising Chinese and Japanese classical music, and won the Just Plain Folks Music Award For Best Music Album for his score of the 2006 film Varalaru (God Father). He co-scored the Shekhar Kapur project and his first British film, Elizabeth: The Golden Age, in 2007. He garnered an Asian Film Award nomination for Best Composer at the Hong Kong International Film Festival for his Jodhaa Akbar score. His compositions have been sampled for other scores within India, and appeared in such films as Inside Man, Lord of War, Divine Intervention and The Accidental Husband. In 2008, Rahman scored his first Hollywood picture, the comedy Couples Retreat released the next year, which won him the BMI London Award for Best Score. Rahman scored the film Slumdog Millionaire in 2008, for which he won a Golden Globe and two Academy Awards, becoming the first Asian to do so. The songs "Jai Ho" and "O...Saya" from the soundtrack of this film met with commercial success internationally. 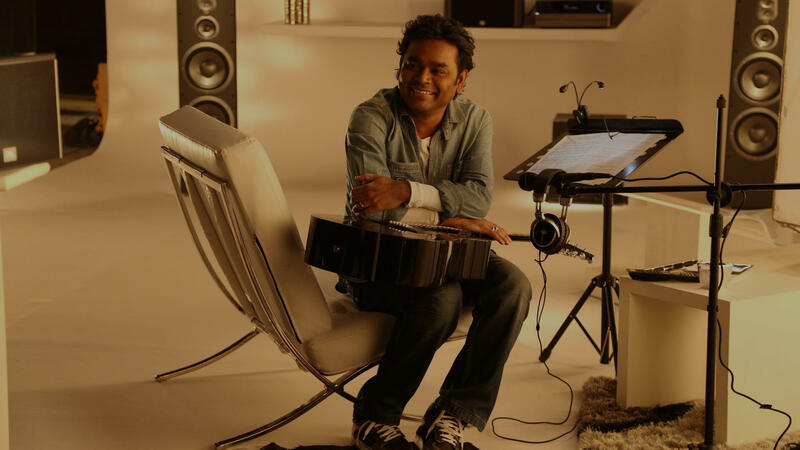 In 2010, Rahman composed scores for the romance film Vinnaithaandi Varuvaayaa, blockbuster sci-fi romance film Enthiran and Danny Boyle's 127 Hours. Rahman started off the year 2011 by scoring Imtiaz Ali's musical film Rockstar. The soundtrack became a phenomenal success and earned Rahman immense critical praise. Rahman has been involved in several projects aside from film. Vande Mataram, an album of his original compositions released on India's 50th anniversary of independence in 1997, enjoyed great commercial success. Vande Mataram is one of the largest selling Indian non-film album to date.He followed it up with an album for the Bharat Bala-directed video Jana Gana Mana, a conglomeration of performances by many leading exponents and artists of Indian classical music. Rahman has written jingles for ads and composed several orchestrations for athletic events, television and internet media publications, documentaries and short films. He frequently enlists the Czech Film Orchestra, Prague and the Chennai Strings Orchestra. In 1999, Rahman partnered with choreographers Shobana and Prabhu Deva and a Tamil cinema dancing troupe to perform with Michael Jackson in Munich, Germany at his "Michael Jackson and Friends" concert. In 2002, he composed the music for his maiden stage production, Bombay Dreams, commissioned by musical theatre composer Andrew Lloyd Webber. Finnish folk music band Varttina collaborated with Rahman to write the music for The Lord of the Rings theatre production and in 2004, Rahman composed the piece "Raga's Dance" for Vanessa-Mae's album Choreography performed by Mae and the Royal Philharmonic Orchestra. Since 2004, Rahman has performed three successful world tours to audiences in Singapore, Australia, Malaysia, Dubai, the United Kingdom, Canada, the United States and India. He has been collaborating with Karen David for her upcoming studio album. A two-disc soundtrack, Introducing A. R. Rahman (2006) featuring 25 of his pieces from Tamil film scores was released in May 2006, and his non-film album, Connections was released on 12 December 2008. Rahman also performed at the White House State dinner arranged by US President Barack Obama during the official visit of Indian Prime Minister Manmohan Singh on 24 November 2009. Rahman is one of over 70 artists who performed on "We Are the World 25 for Haiti", a charity single to raise emergency relief funds in the wake of the 2010 Haiti earthquake. In 2010, Rahman composed "Jai Jai Garvi Gujarat" in honor of the 50th anniversary of the formation of Gujarat State, "Semmozhiyaana Thamizh Mozhiyaam" as part of World Classical Tamil Conference 2010, and the official theme song of the 2010 Commonwealth Games, "Jiyo Utho Bado Jeeto". 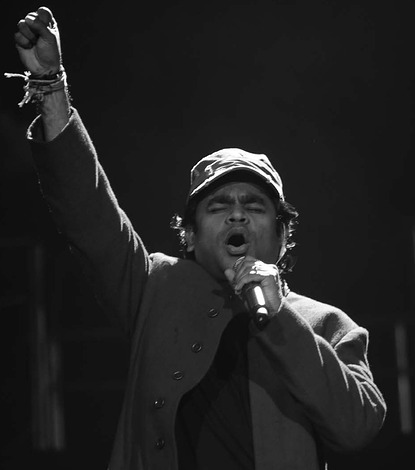 Rahman organised his first world tour, named A. R. Rahman Jai Ho Concert: The Journey Home World Tour, in 2010. The tour was kicked off on 11 June at the Nassau Coliseum in New York and span 16 major cities worldwide. Some of his notable compositions were performed live by the London Philharmonic Orchestra in April 2010. In February 2011, Rahman collaborated with Michael Bolton for his new studio album Gems - The Duets Collection. Rahman reworked on his song "Sajna" from the 2009 American film Couples Retreat to create the track. On 20 May 2011, English musician Mick Jagger announced the formation of a new supergroup, SuperHeavy, which includes Dave Stewart, Joss Stone, Damian Marley, and Rahman. The band's self-titled album is slated for release in September 2011. The album will see Mick Jagger singing in Rahman's composition "Satyameva Jayate", which translates to "the truth alone triumphs". In January 2012, it was announced the German Film Orchestra Babelsberg would join KM Music Conservatory musicians in a 100-member concert tour of five Indian cities performing Rahman's compositions. The tour, named "Germany and India 2011-2012: Infinite Opportunities'. Classic Incantations", will mark the centenary of Indian cinema and of Studio Babelsberg, the world's oldest film studio. In Summer 2012, Rahman composed a Punjabi song for the London Olympics opening ceremony, organised by Danny Boyle. It was part of a medley which showcased Indian influence in the UK, according to Boyle's wishes. Another Indian musician, Ilaiyaraja's song from Tamil-language film Ram Lakshman (1981), has also been chosen as part of the medley. On 20 December 2012, Rahman released the single "Infinite Love" in both English and Hindi commemorating the last day of the Mayan calendar to spread hope, peace and love.